Script includes support for 130 languages, including IME - Chinese, Japanese and thers. Keyboard is easy skinnable by using CSS. Tip: this demo contains three layouts, you can switch them through q.skin variable in vk_loader.js file. 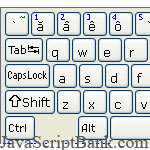 I have a German QWERTZ-keyboard and when pressing "Z" or "Y", the wrong buttons on the virtual keyboard are triggered. Pressing "Z" triggers the button at the "Y"-place (i.e. where the "Z" on an American QWERTY keyboard is) and vice versa. Browser is Chromium 5.0.368.0 on Ubuntu Linux. In it something is also to me it seems it is very good idea. Completely with you I will agree. In my opinion you are not right. I am assured. I can prove it. Write to me in PM, we will discuss. Certainly. And I have faced it. Let's discuss this question. Here or in PM. I apologise, but, in my opinion, you commit an error. My God! Well and well! Completely I share your opinion. It is good idea. I support you. Absolutely with you it agree. In it something is and it is good idea. It is ready to support you. Now all became clear, many thanks for an explanation. I think, that you are mistaken.